Graphic 45 combines the vintage style of the 1920's and 30's with vibrant color, irresistible texture and imaginative design to create paper collections with a decades-old appeal that's both fresh and familiar. There's so much to love about Graphic 45...the vintage style, the wonderful combination of patterns, and the unique style of their papers, embellishments, and stamps. In today's newsletter, we announced that our order of new Graphic 45 paper pads, Bird Song and Nutcracker Sweet, are now in stock and shipping! We also have a selection of coordinating stamps and those stamps are what I was excited to tear in to and share with you today! 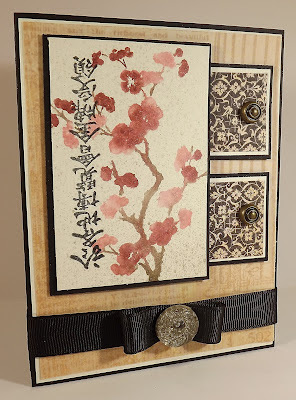 Since I am a fan of Asian inspired stamps and patterns, I opted to use the Bird Song I stamp set combined with some Ladies Diary paper that I had in my stash. To create the background for my image I first spritzed my cardstock with some Perfect Pearls. I then used Distress Markers to color directly on to the stamp. Before I stamped the image, I used a Mini Mister to spritz the stamp with water before stamping. Because the Distress Markers react with water, my stamped image has a nice watercolor effect. 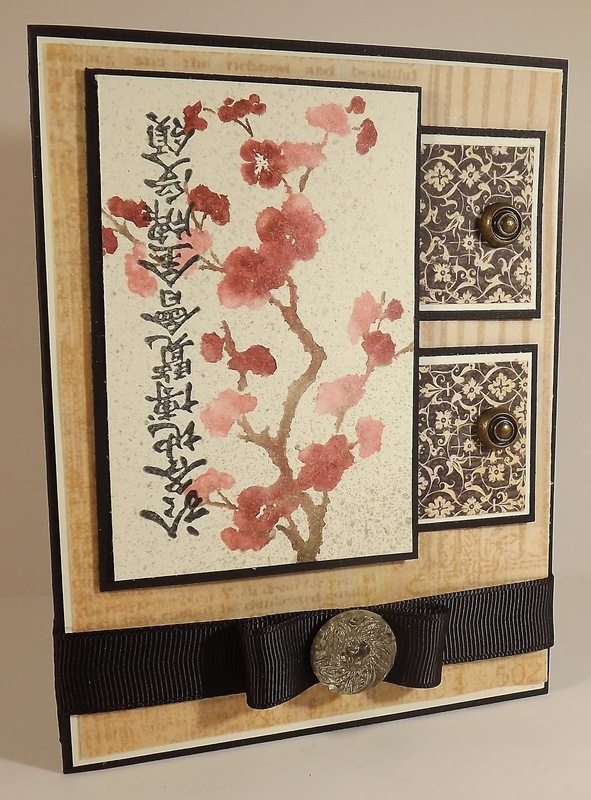 Then I added the sentiment in Tuxedo Black on top of the cherry blossom image. The I assembled my card, adding Graphic 45 metal brads and a button from the Fanciful collection. Thanks for the heads up though!! Such an elegant beautiful card, Kim! Gorgeous!!! Love the water color effect with all the spritzing..perfect! Colors are perfect!